Overcoming a pair of key injuries early Friday night, Boulder City High School football team was able to squeeze out a 29-13 victory against Western behind a physical style of football. Laura Hubel/Boulder City Review Behind the Eagles' dominating offensive line, quarterback Shaun Jones helped Boulder High High School start off strong with two running touchdowns in the first quarter against Western on Friday, Sept. 1. The Eagles won 29-13. 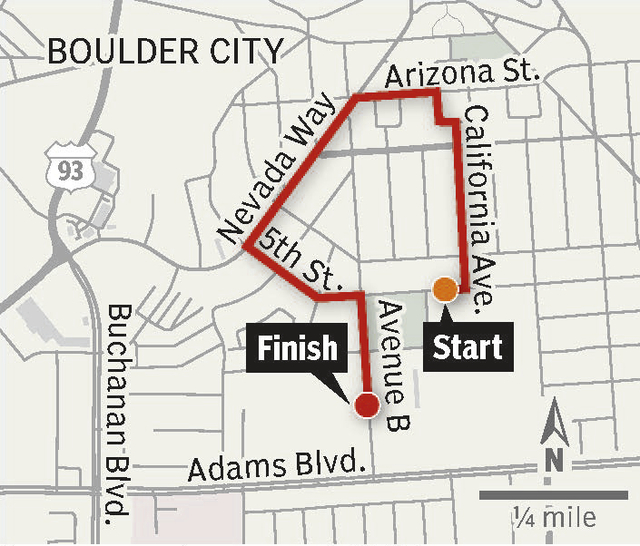 As part of homecoming festivities, Boulder City High School will present a parade from the school to downtown and back to the football field. The parade begins at 6 p.m. today, with a tailgate party immediately afterward. Losing senior two-way star Zach Trone on the opening kickoff, the Eagles also had to overcome the loss of junior running back Thorston Balmer, who was the team’s week one hero against Clark with 150 rushing yards and three touchdowns. Looking to unleash Balmer early, the junior powerback carried on the game’s first five plays, generating 52 yards on the ground before exiting the game with an undisclosed injury. Junior dual-threat quarterback Shaun Jones made sure Balmer’s work didn’t go unfinished, capping off the game’s opening drive with a 4-yard rushing touchdown. Despite playing shorthanded without Balmer and Trone, who start both offensively and defensively, the Eagles were able to jump out to a 21-0 lead at halftime, taking advantage of great field position. Scoring his second rushing touchdown, Jones put the Eagles ahead 14-0 with a goal-line plunge, followed by a 6-yard touchdown pass from senior quarterback Austin Langley to senior Briggs Huxford early in the second quarter. The star of Friday’s game, Huxford also grabbed a pair of interceptions on defense, while making three tackles. Helping a much-improved Eagles’ defensive unit, the junior tandem of linebacker Jimmy Dunagan (nine tackles) and defensive lineman Ryan Vanario (two tackles, two sacks) continue to impress their head coach. Playing the hero on offense as well, Dunagan silenced any momentum Western might have gained with a 13-0 third quarter run, putting the Eagles ahead permanently 29-13 with a 5-yard touchdown early in the fourth quarter. Dunagan finished the night with 62 yards and a touchdown on 12 carries, behind an overpowering Eagles’ offensive line led by senior Cole Smyth and junior Mike Kaposta. Jones added 31 yards and two scores on seven carries. 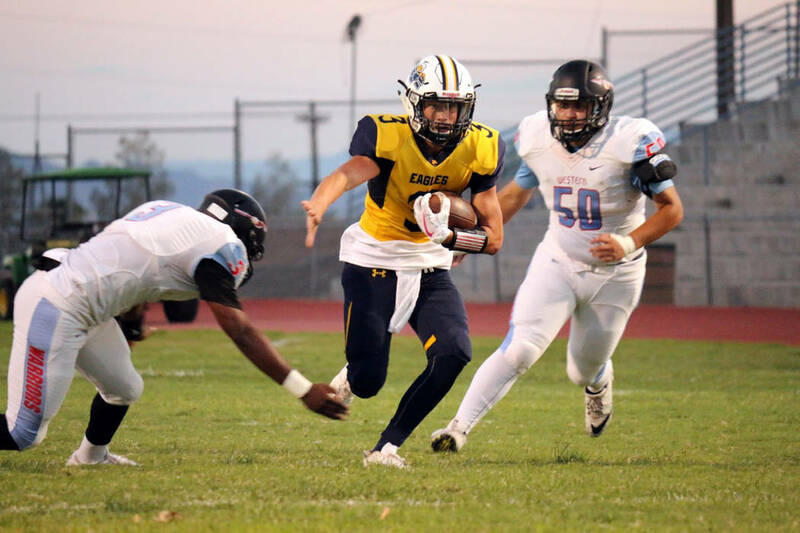 Looking for their first 3-0 start since 2012 when the Eagles started their season 6-0, Boulder City will host Needles at 7 p.m. Friday for their homecoming game. Hosting a doubleheader Friday, the Eagles freshman team will play at 4:30 p.m.